1. Make sure you have friends who sail or want to learn. You’ll need crew — lots — since most non-sailing friends will show up a couple of times for the novelty, trust that docking is no fun without help. Find additional friends. 2. Pay attention in NY Harbor. Picture aside, there is a lot of traffic — besides planes falling out of the sky. Also there are several sailing schools, so while you might expect someone to bear away, toss expectations and get out of the way. 3. Use the relatively protected area (as oppossed to the ocean) to get comfortable with your gear. When you lease a boat you’re rolling with whatever the boat has. Get your own VHF, GPS, charts, and apparel appropriate for the weather. I tested inavx.com as an iPhone App and its a pretty good secondary chart/GPS; for your primary you’d want something bigger; and a device more rugged than the iPhone. I like the app though and it keeps getting better. Not a bad idea to carry a Garmin or similar though if you’re in the ocean (and a paper chart). I rent a satelite phone if I’m on the ocean overnight – could be a lifesaver and cost about $5/$6 a day. 4. Speaking of weather — avoid weather (rain, wind, etc). Get accurate info from NOAA. Before your leave. Easy to avoid in NYC harbor a little more challenging on a trip — but you know that. 5. Watch the tides — NY Harbor has some pretty serious tides — especially around the infamous Hells Gate. It has the name for a reason. If you can only go 5 knots and you hit a current of 3 knots — well you have some issues. Worse in some ways is if you’re moving with the current and now 8 knots and you can’t accelerate out of turn. Don’t want to kiss the bridge. Another great iPhone app AyeTides can keep you out of trouble. 6. Make sure you can actually leave the office (and leave it behind at least for a few hours). Mission not accomplished there for me, but baby business is demanding. Your call if you can swing it. That said, sailing overall is declining. Even before the recession. 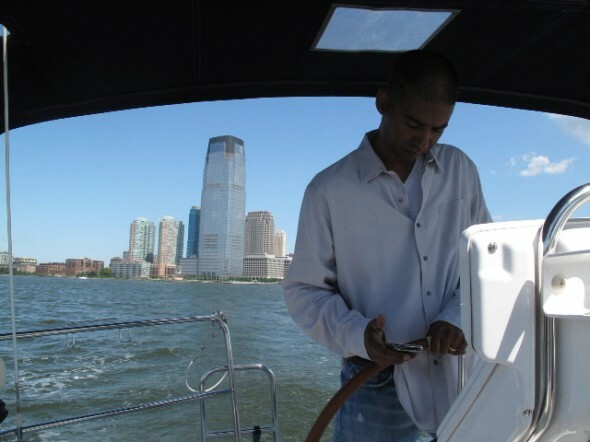 Sure it’s expensive to “own” a boat, but you can sail for free if you’re crew — the NY Times covered crewing and if you’re up for it, it’s one way to learn. It’s really how I took my first deep dive in sailing — crewing 1500 miles from St Lucia to Panama. The above are just a couple thoughts…see you out there…. This entry was posted by John Pasmore on Friday, November 20th, 2009 at 8:44 pm	and is filed under Outdoor and tagged with AyeTides, Bennettau, Bennettau 32, GPS, INavx, iphone, NY Harbor, Sail, Sailiboat, Sailing, Satellite Phone. You can follow any responses to this entry through the RSS 2.0 feed.